If you’ve come to this page, it’s likely that you have gaps in your smile and you’re starting to worry about them. Maybe they’re making you feel self-conscious, or perhaps talking and eating are becoming uncomfortable. You might have even noticed that your remaining teeth are starting to gradually drift into the gaps. These are all common side effects of missing teeth, and in the long run, they can severely damage your smile. Fortunately, we can help. On this page, you can read about how we can replace your missing teeth and restore your oral health at the same time. 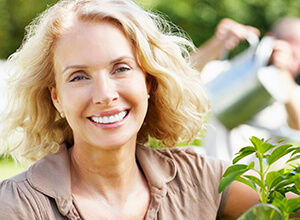 Whether you’re missing a single tooth or an entire mouthful, you can trust that Meriden Dental Group will have the right restorative dentistry treatment to help you get your smile back. 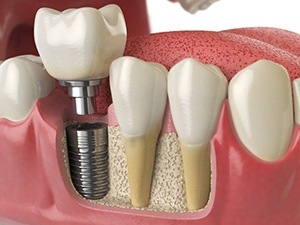 When it comes to tooth replacement, nothing does it better than dental implants. Dental professionals across the world agree that they offer the best solution both medically and cosmetically, and that’s because they actually replace the entire structure of your tooth from root to crown. No other procedure does this, and unlike many practices, we can perform the entire procedure right here in our office. That means we can fully restore your smile in much less time. Do you have a row of missing teeth that creates a large gap in your smile? A dental bridge could be the exact solution you are looking for. Using a couple of strategically placed crowns, we can complete your smile and make you look and feel great with just a few easy appointments. We have been using bridges to help people with missing teeth for years, and the reason is simple: they work. If you are missing an entire arch of teeth, you are at risk of developing a multitude of additional dental and overall health problems. Thankfully, we can give you your smile AND your peace of mind back with a set of full dentures. We can use them to replace an entire row of teeth, and thanks to modern techniques, we’ll be able to ensure you get the ideal look and fit you want. Is your smile marred by missing teeth throughout your mouth? Don’t worry, because we can replace them using a partial denture. This prosthetic will simply slide into your mouth like a missing puzzle peace and seamlessly fill in the gaps. It’s held firmly in place with small metal clasps, and you’ll easily be able to remove it to clean it and your teeth. It’s one of the quickest and simplest solutions to helping you smile again. Contact Meriden Dental Group today to schedule an appointment with our team. Located in Meriden, CT, we provide a wide variety of services so that every member of your family can receive the care they need to enjoy a healthy, happy smile.